Butternut squash is a type of winter squash that originated in South America. This vegetable has a yellow outer skin and yellow orange flesh with a sweet nutty taste. Butternut Squash can be boiled, roasted or mashed and eaten alone or cooked in casserole and soups or used to make baked goods like bread and muffins. The seeds, skin and stalk must be removed before cooking. 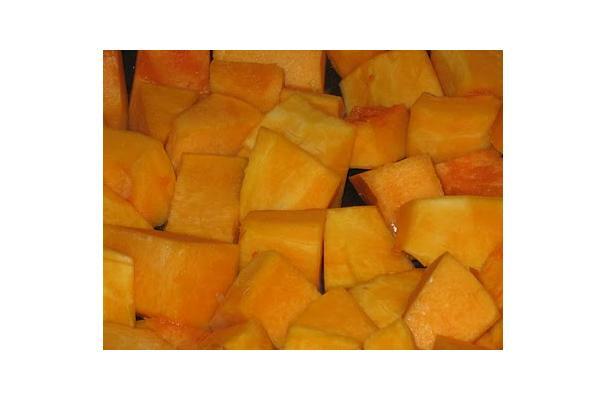 Butternut squash is an elongated squash with a "pearish" shape that has a flesh colored to light orange exterior shell. Colors: Flesh colored to orange exterior shell with a yellow orange flesh. Choosing: When selecting a butternut squash, avoid ones with green colorings since this indicates harvest before maturity. Buying: You can buy summer squash at your nearest supermarket under the vegetables area and on your local market place. If you are a gardening novice or are just looking for something easy to grow, butternut squash may be a good choice. This squash has a sweet, nutty flavor and can be used in a variety of recipes or cooked and eaten by itself. Read on to learn how to grow butternut squash. Give your seeds warm soil and room to grow. Because butternut squash is a somewhat delicate plant, if you are planting seeds directly into the soil, be sure to wait until after the danger of frost has passed. You can also plant seeds in individual pots filled with peat and plant in the ground when it has thawed. Butternut squash seeds should be planted in hills about 1/2- to 1-inch deep in the soil, and the seeds should be spaced 4 inches apart. Hills should be 4 to 6 feet apart. Water regularly. Water your butternut squash seeds upon planting and then every two to three days until germination. However, do not saturate the ground, as squash grows best in moderately moist soil. Feed your plants. Squash grows well in rich soil, so fertilizing regularly will help you grow healthy plants. Some experts even recommend initially side dressing the fertilizer into the soil, and then continuing to feed the soil fertilizer on a regular basis. Thin the hills. After your plants are 4 inches high, thin the hills to three plants per hill. Because this type of squash will grow to be 8 to 10 inches long, the plants will need plenty of room after they begin to sprout vines. Protect your plants. All squash is susceptible to insect and fungus Minimize damage. There are many products out on the market, both organic and non-organic, that will help minimize damage to your butternut squash. If you choose to use insecticides, it is recommended to wait until the evening hours. This keeps the bees from being affected by the insecticides as you need them to pollinate your plants. Harvest your butternut squash. Butternut squash is ripe after the rind has hardened and when there is about 2 inches of stem. If you pick it before it is ripe it will lack flavor, and if you cut the stem while it is too short, it will not keep very long. Also, this squash needs to be harvested before the fall frost, as it will kill the plant and damage the fruit. With its sweet and orange flesh the butternut squash is often used in soups and baked goods and frequently combined with pumpkin or sweet potato dishes. The peel is beige and thick and the shape is elongated with a bulb at one end. The variety contains high amounts of beta-carotene and trace amounts of the B vitamins, but also contains iron, calcium, magnesium, and potassium. Cleaning: Clean squash with running water. If squash is waxed, rub it thoroughly. The squash can be stored for months in 50°F to 55°F. If refrigerating the squash it becomes more prone to rotting once taken out of storage. However, if the squash is cut, it can be stored in the refrigerator for up to a week. Today the major squash producing states include Florida, California, Georgia, New Jersey, and Texas. History: Squash has an ancient history originating back to 3000 BCE, where the Ancient American Indians commonly consumed what they called “the apple of God”. The seeds of squash was believed to increase fertility, thus were commonly planted close to many homes. Although, some historians disagree, squash originates from the American continent. The vegetable was not introduced to Europe before the Columbus era in the 16th century. However, it was not commonly consumed until the 19th century.